Solvent treatment methods for treating fabric articles, more particularly it relates to glycerine derivative solvent treatment methods are provided by the present invention. This application claims the benefit of U.S. Provisional Application Ser. No. 60/483,347, filed on Jun. 27, 2003; and U.S. Provisional Application Ser. No. 60/520,517, filed on Nov. 17, 2003. The present invention relates to solvent treatment methods for treating fabric articles, more particularly it relates to glycerine derivative solvent treatment methods. Typically, the laundering of fabric articles is performed by conventional aqueous immersive laundry cleaning or dry cleaning. Conventional laundry cleaning is carried out with relatively large amounts of water. Cleaning additives such as surfactants, enzymes, bleaches, and fabric softeners are added and mixed with the water to provide cleaning, whitening, softening and like benefits. The aqueous-based laundering process is typically performed in a washing machine or by hand at the consumer's home, or in a dedicated place such as a coin laundry. Although washing machines and laundry detergents have become quite sophisticated, the conventional aqueous-based laundry process still exposes the fabric articles to risks of shrinkage, wrinkles, and other undesirable results. Most dry cleaning processes rely on non-aqueous solvents for cleaning. By avoiding water these processes minimize the risk of shrinkage and wrinkling for certain fabrics, including cotton, polyester, silk, rayon, wool and various blends of these materials. The need for handling and recovering large amounts of solvents make these dry cleaning processes unsuitable for use in the consumer's home. The need for dedicated dry cleaning operations makes this form of cleaning inconvenient and expensive for the consumer. Moreover, the conventional solvents for the dry cleaning process, such as perchloroethylene (“PERC”), are causing environmental and health concerns. Accordingly, there is a need provide an alternative solvent for laundering fabric articles that is safe, environmentally-friendly, and with the undesirable effects of shrinkage, wrinkles, and the like. Moreover, there is a need for an alternative solvent that provide all of the above benefits and is suitable for use in home laundering as well in commercial laundering services. The present invention relates to an improved solvent treatment method for treating a fabric article which comprises the step of contacting the fabric article with a glycerine derivative solvent, optionally an adjunct solvent, an adjunct ingredient, a polar phase and mixtures thereof. “Fabric article” as used herein is intended to mean any article that is customarily cleaned in a conventional laundry process or in a dry cleaning process. As such the term encompasses articles of clothing, linen, drapery, and clothing accessories. The term also encompasses other items made in whole or in part of fabric, such as tote bags, furniture covers, tarpaulins and the like. The term “dry cleaning” or “non-aqueous cleaning” as used herein means a non-aqueous fluid is used as the dry cleaning solvent to clean a fabric article. However, water can be added to the “dry cleaning” method as an adjunct cleaning agent and/or a polar phase. The amount of water can comprise up to about 25% by weight of the dry cleaning solvent or the cleaning composition in a “dry cleaning” process. The non-aqueous fluid is referred to as the “dry cleaning solvent”. The term “fabric article treating composition” refer to the wash fluid that that comes into direct contact with fabric articles to be cleaned. It should be understood that the term “fabric article treating composition” encompasses uses other than cleaning, such as refreshing, conditioning and sizing. In a typical embodiment, the fabric article treating composition comprises the glycerine ether solvent(s) and optionally, adjunct solvents, adjunct ingredients, polar solvents, and mixtures thereof, all of which are described in more detail hereinbelow. “Average molecular weight” as used herein means the weight-average molecular weight of a polymer, as determined by gel permeation chromatography. wherein R1, R2 and R3 are each independently selected from: H; branched or linear, substituted or unsubstituted C1-C30 alkyl, C2-C30 alkenyl, C1-C30 alkoxycarbonyl, C3-C30 alkyleneoxyalkyl, C1-C30 acyloxy, C7-C30 alkylenearyl; C4-C30 cycloalkyl; C6-C30 aryl; and mixtures thereof; and wherein two or more of R1, R2 and R3 together can form a C3-C8 aromatic or non-aromatic, heterocyclic or non-heterocyclic ring. Nonlimiting examples of suitable glycerine derivative solvents include 2,3-bis(1,1-dimethylethoxy)-1-propanol; 2,3-dimethoxy-1-propanol; 3-methoxy-2-cyclopentoxy-1-propanol; 3-methoxy-1-cyclopentoxy-2-propanol; carbonic acid (2-hydroxy-1-methoxymethyl)ethyl ester methyl ester; glycerol carbonate and mixtures thereof. The glycerine derivative solvent may be present in a fabric article treating composition along with adjunct solvents and adjunct ingredients. Adjunct solvents may be used in combination with the glycerine derivative solvents of the present invention. The adjunct solvents include, but are not limited to, lipophilic fluids. “Lipophilic fluid” as used herein means any liquid or mixture of liquid that is immiscible with water at up to 20% by weight of water. In general, a suitable lipophilic fluid can be fully liquid at ambient temperature and pressure, can be an easily melted solid, e.g., one that becomes liquid at temperatures in the range from about 0° C. to about 60° C., or can comprise a mixture of liquid and vapor phases at ambient temperatures and pressures, e.g., at 25° C. and 1 atm. pressure. The test to determine whether a fluid is a lipophilic fluid is disclosed in PCT publication WO 01/94678. It is preferred that the lipophilic fluid herein be non-flammable or, have relatively high flash points and/or low VOC characteristics, these terms having conventional meanings as used in the dry cleaning industry, to equal or, preferably, exceed the characteristics of known conventional dry cleaning fluids. Non-limiting examples of suitable lipophilic fluid materials include siloxanes, other silicones, hydrocarbons, glycol ethers, fluorinated solvents, low-volatility nonfluorinated organic solvents, diol solvents, other environmentally-friendly solvents and mixtures thereof. “Siloxane” as used herein means silicone fluids that are non-polar and insoluble in water or lower alcohols. Linear siloxanes (see for example U.S. Pat. Nos. 5,443,747, and 5,977,040) and cyclic siloxanes are useful herein, including the cyclic siloxanes selected from the group consisting of octamethyl-cyclotetrasiloxane (tetramer), dodecamethyl-cyclohexasiloxane (hexamer), and preferably decamethyl-cyclopentasiloxane (pentamer, commonly referred to as “D5”). A preferred siloxane comprises more than about 50% cyclic siloxane pentamer, more preferably more than about 75% cyclic siloxane pentamer, most preferably at least about 90% of the cyclic siloxane pentamer. Also preferred for use herein are siloxanes that are a mixture of cyclic siloxanes having at least about 90% (preferably at least about 95%) pentamer and less than about 10% (preferably less than about 5%) tetramer and/or hexamer. Nonlimiting examples of fluorinated solvents suitable for use herein as the lipophilic solvents include perfluorinated amines, perfluorinated ethers, perfluorinated alcohols and hydrofluoroethers. In some embodiments, perfluorinated amines are used. In other embodiments, specific perfluorinated amines, such as perfluorotributylamines, are used. Other suitable lipophilic fluids include, but are not limited to, diol solvent systems e.g., higher diols, such as C6 or C8 or higher diols; organosilicone solvents including both cyclic and acyclic types; and the like, and mixtures thereof. Non-limiting examples of low volatility non-fluorinated organic solvents OLEAN® and other polyol esters, or certain relatively nonvolatile biodegradable mid-chain branched petroleum fractions. Non-limiting examples of glycol ethers include propylene glycol methyl ether, propylene glycol n-propyl ether, propylene glycol t-butyl ether, propylene glycol n-butyl ether, dipropylene glycol methyl ether, dipropylene glycol n-propyl ether, dipropylene glycol t-butyl ether, dipropylene glycol n-butyl ether, tripropylene glycol methyl ether, tripropylene glycol n-propyl ether, tripropylene glycol t-butyl ether, tripropylene glycol n-butyl ether. Non-limiting examples of other silicone solvents, in addition to the siloxanes, are well known in the literature, see, for example, Kirk Othmer's Encyclopedia of Chemical Technology, and are available from a number of commercial sources, including GE Silicones, Toshiba Silicone, Bayer, and Dow Corning. For example, one suitable silicone solvent is SF-1528 available from GE Silicones. Additional examples of other environmentally-friendly solvents include lipophilic fluids that have an ozone formation potential of from about 0 to about 0.31, lipophilic fluids that have a vapor pressure of from about 0 to about 0.1 mm Hg, and/or lipophilic fluids that have a vapor pressure of greater than 0.1 mm Hg, but have an ozone formation potential of from about 0 to about 0.31. Non-limiting examples of such lipophilic fluids that have not previously been described above include carbonate solvents (i.e., methyl carbonates, ethyl carbonates, ethylene carbonates, propylene carbonates, glycerine carbonates), succinate solvents (i.e., dimethyl succinates), and mixtures thereof. A methodology to determine ozone reactivity is discussed in W. P. L. Carter, “Development of Ozone Reactivity Scales of Volatile Organic Compounds”, Journal of the Air & Waste Management Association, Vol. 44, Page 881-899, 1994. “Ozone Reactivity” as used herein is a measure of the ability of a volatile organic compound (VOC) to form ozone in the atmosphere. It is measured as grams of ozone formed per gram of volatile organics. “Vapor Pressure” as used can be measured by techniques defined in Method 310 of the California Air Resources Board. In one embodiment, the lipophilic fluid comprises more than 50% by weight of the lipophilic fluid of cyclopentasiloxanes, (“D5”) and/or linear analogs having approximately similar volatility, and optionally, the D5-containing lipophilic fluid is complemented by other silicone solvents. Optionally, adjunct ingredients may be added to the glycerine derivative solvents. Suitable cleaning adjuncts include, but are not limited to, builders, surfactants, enzymes, bleach activators, bleach catalysts, bleach boosters, bleaches, alkalinity sources, antibacterial agents, colorants, perfumes, pro-perfumes, finishing aids, lime soap dispersants, composition malodor control agents, odor neutralizers, polymeric dye transfer inhibiting agents, crystal growth inhibitors, photobleaches, heavy metal ion sequestrants, anti-tarnishing agents, anti-microbial agents, anti-oxidants, anti-redeposition agents, soil release polymers, electrolytes, pH modifiers, thickeners, abrasives, divalent or trivalent ions, metal ion salts, enzyme stabilizers, corrosion inhibitors, diamines or polyamines and/or their alkoxylates, suds stabilizing polymers, solvents, process aids, fabric softening agents, optical brighteners, hydrotropes, suds or foam suppressors, suds or foam boosters, fabric softeners, antistatic agents, dye fixatives, dye abrasion inhibitors, anti-crocking agents, wrinkle reduction agents, wrinkle resistance agents, soil release polymers, soil repellency agents, sunscreen agents, anti-fade agents, anti-static agents, and mixtures thereof. In any event, any adjunct ingredient must be suitable for use in combination with the solvent. Suitable adjunct ingredients may include detersive enzymes, such as proteases, amylases, cellulases, lipases and the like, as well as bleach catalysts including the macrocyclic types having manganese or similar transition metals all useful in laundry and cleaning products can be used herein at very low, or less commonly, higher levels. For example, the detersive enzymes and/or bleach catalyst may be present in the composition of the present invention at a level typically less than about 5%, more typically less than about 1%, and even more typically less than about 0.1%, by weight of the composition. Adjunct materials that are catalytic, for example enzymes, can be used in “forward” or “reverse” modes. For example, a lipolase or other hydrolase may be used, optionally in the presence of alcohols as adjuncts, to convert fatty acids to esters, thereby increasing their solubility in the solvent. This is a “reverse” operation. In contrast, the normal use of this hydrolase in water is to convert a less water-soluble fatty ester to a more water-soluble material. The adjunct ingredient suitable for use herein may also comprise emulsifiers. Emulsifiers are well known in the chemical art. Essentially, an emulsifier acts to bring two or more insoluble or semi-soluble phases together to create a stable or semi-stable emulsion. It is preferred in the claimed invention that the emulsifier serves a dual purpose wherein it is capable of acting not only as an emulsifier but also as a treatment performance booster. For example, the emulsifier may also act as a surfactant to boost the cleaning performance. The term “surfactant” conventionally refers to materials that are surface-active either in the water, the lipophilic fluid, or the mixture of the two. Some illustrative surfactants include nonionic, cationic, anionic and silicone surfactants as disclosed below. y and z are integers independently selected from 1 to 10. Examples of these surfactants are disclosed in U.S. Patent Applications Ser. Nos. 60/483,343 and 60/482,958, filed on Jun. 27, 2003.
b) fatty alcohol ethoxylates, R—(OCH2CH2)aOH a=1 to 100, typically 12-40, R=hydrocarbon residue 8 to 20 C atoms, typically linear alkyl. Examples polyoxyethylene lauryl ether, with 4 or 23 oxyethylene groups; polyoxyethylene cetyl ether with 2, 10 or 20 oxyethylene groups; polyoxyethylene stearyl ether, with 2, 10, 20, 21 or 100 oxyethylene groups; polyoxyethylene (2), (10) oleyl ether, with 2 or 10 oxyethylene groups. Commercially available examples include, but are not limited to: ALFONIC, BRU, GENAPOL, NEODOL, SURFONIC, TRYCOL; additional examples are described in U.S. Pat. No. 6,013,683, issued to Hill et al. where each R′R″ is independently selected from the group consisting of 12-30 C atoms or derived from tallow, coconut oil or soy, X=Cl or Br, Examples include: didodecyldimethylammonium bromide (DDAB), dihexadecyldimethyl ammonium chloride, dihexadecyldimethyl ammonium bromide, dioctadecyldimethyl ammonium chloride, dieicosyldimethyl ammonium chloride, didocosyldimethyl ammonium chloride, dicoconutdimethyl ammonium chloride, ditallowdimethyl ammonium bromide (DTAB). Commercially available examples include, but are not limited to: ADOGEN, ARQUAD, TOMAH, VARIQUAT. Additional examples are described in U.S. Pat. No. 6,013,683, issued to Hill et al. One class of surfactants suitable for use herein is siloxane-based surfactants. The siloxane-based surfactants typically have a weight-average molecular weight from 500 to 20,000. Such materials, derived from poly(dimethylsiloxane), are well known in the art. In the present invention, not all such siloxane-based surfactants are suitable, because they do not provide improved cleaning of soils compared to the level of cleaning provided by the glycerine derivative solvent itself. D″ is R6 2SiO2/2 wherein R6 is independently H, an alkyl group or (CH2)l(C6H4)m(A)n-[(T)o-(A′)p-]q-(T′)rZ(G)s, wherein 1 is 1-10; m is 0 or 1; n is 0-5; o is 0-3; p is 0 or 1; q is 0-10; r is 0-3; s is 0-3;C6Q4 is unsubstituted or substituted with C1-10 alkyl or C1-10 alkenyl; Q is independently H, C1-10 alkyl, C1-10 alkenyl, or mixtures thereof; A and A′ are each independently a linking moiety representing an ester, a keto, an ether, a thio, an amido, an amino, a C1-4 fluoroalkyl, a C1-4 fluoroalkenyl, a branched or straight chained polyalkylene oxide, a phosphate, a sulfonyl, a sulfate, an ammonium, and mixtures thereof; T and T′ are each independently a C1-30 straight chained or branched alkyl or alkenyl or an aryl which is unsubstituted or substituted; Z is a hydrogen, carboxylic acid, a hydroxy, a phosphato, a phosphate ester, a sulfonyl, a sulfonate, a sulfate, a branched or straight-chained polyalkylene oxide, a nitryl, a glyceryl, an aryl unsubstituted or substituted with a C1-30 alkyl or alkenyl, a carbohydrate unsubstituted or substituted with a C1-10 alkyl or alkenyl or an ammonium; G is an anion or cation such as H+, Na+, Li+, K+, NH4 +, Ca+2, Mg30 2, Cl−, Br−, I−, mesylate or tosylate; D″ can be capped with C1-C4 alkyl or hydroxy groups. Examples of the types of siloxane-based surfactants described herein above may be found in EP 1,043,443A1, EP 1,041,189A1 and WO 01/34,706 (all to GE Silicones) and U.S. Pat. No. 5,676,705, U.S. Pat. No. 5,683,977, U.S. Pat. No. 5,683,473, and EP1,092,803A1 (all to Lever Brothers). Nonlimiting commercially available examples of suitable siloxane-based surfactants are TSF 4446 (by General Electric Silicones), XS69-B5476 (by General Electric Silicones); Jenamine HSX (by DelCon) and Y12147 (by OSi Specialties). Another class of materials suitable for use herein as the surfactant component is organic-based surfactants. In some embodiments, the surfactants are organosulfosuccinate surfactants, with carbon chains of from about 6 to about 20 carbon atoms. In other embodiments, the surfactants are organosulfosuccinates containing dialkly chains, each with carbon chains of from about 6 to about 20 carbon atoms. In yet another embodiment, the organosulfosuccinate surfactants contain chains of aryl or alkyl aryl, substituted or unsubstituted, branched or linear, saturated or unsaturated groups. Nonlimiting examples of suitable organosulfosuccinate surfactants are available under the tradenames of Aerosol® OT and Aerosol® TR-70 (by Cytec). wherein R8 is an alkyl group or an alkyl aryl group, selected from the group consisting of primary, secondary and branched chain alkyl hydrocarbyl groups, primary, secondary and branched chain alkenyl hydrocarbyl groups, and/or primary, secondary and branched chain alkyl- and alkenyl-substituted phenolic hydrocarbyl groups having from about 6 to about 20 carbon atoms, preferably from about 8 to about 18, more preferably from about 10 to about 15 carbon atoms; s is an integer from about 2 to about 45, preferably from about 2 to about 20, more preferably from about 2 to about 12; B is a hydrogen, a carboxylate group, or a sulfate group; and linking group Z is —O—, —C(O)O—, —C(O)N(R)—, or —C(O)N(R)—, and mixtures thereof, in which R, when present, is R8 or hydrogen. The nonionic surfactants herein are characterized by an HLB (hydrophilic-hydrophobic solvent balance) of from 5 to 20, preferably from 6 to 15. In some embodiments, the nonionic surfactants are alkyl ethoxylate surfactants with each R8 being C8-C16 straight chain and/or branch chain alkyl and the number of ethyleneoxy groups s being from about 2 to about 6, preferably from about 2 to about 4, more preferably with R8 being C8-C15 alkyl and s being from about 2.25 to about 3.5. These nonionic surfactants are characterized by an HLB of from 6 to about 11, preferably from about 6.5 to about 9.5, and more preferably from about 7 to about 9. Nonlimiting examples of commercially available alkyl ethoxylate surfactants are Neodol® 91-2.5 (C9-C10, s=2.7, HLB=8.5), Neodol® 23-3 (C12-C13, s=2.9, HLB=7.9) and Neodol® 25-3 (C12-C15, s=2.8, HLB=7.5). Neodol® are available from Shell Chemicals. Further nonlimiting examples include nonionic surfactants selected from the group consisting of fatty acid (C12-18) esters of ethoxylated (EO5-100) sorbitans. In some embodiments, the surfactant is selected from the group consisting of mixtures of laurate esters of sorbitol and sorbitol anhydrides; mixtures of stearate esters of sorbitol and sorbitol anhydrides; and mixtures of oleate esters of sorbitol and sorbitol anhydrides. In one specific embodiment, the surfactant is selected from the group consisting of Polysorbate® 20, which is a mixture of laurate esters of sorbitol and sorbitol anhydrides consisting predominantly of the monoester, condensed with about 20 moles of ethylene oxide. In another embodiment, the Polysorbate® 60 which is a mixture of stearate esters of sorbitol and sorbitol anhydride, consisting predominantly of the monoester, condensed with about 20 moles of ethylene oxide. In yet another embodiment, the Polysorbate® 80 which is a mixture of oleate esters of sorbitol and sorbitol anhydrides, consisting predominantly of the monoester, condensed with about 20 moles of ethylene oxide; and mixtures thereof. Other examples of ethoxylated surfactant include carboxylated alcohol ethoxylate, also known as ether carboxylate, with R8 having from about 12 to about 16 carbon atoms and s being from about 5 to about 13; ethoxylated quaternary ammonium surfactants, such as PEG-5 cocomonium methosulfate, PEG-15 cocomonium chloride, PEG-15 oleammonium chloride and bis(polyethoxyethanol)tallow ammonium chloride. Other suitable nonionic ethoxylated surfactants are ethoxylated alkyl amines derived from the condensation of ethylene oxide with hydrophobic alkyl amines, with R8 having from about 8 to about 22 carbon atoms and s being from about 3 to about 30.
wherein R2 is selected from the group consisting of alkyl, alkylphenyl, hydroxyalkyl, hydroxyalkylphenyl, and mixtures thereof in which the alkyl groups contain from 10 to 18, preferably from 12 to 14, carbon atoms; n is 2 or 3, preferably from about 1.3 to about 3, most preferably from about 1.3 to about 2.7. The glycosyl is preferably derived from glucose. wherein R1 is H, or R1 is C1-4 hydrocarbyl, 2-hydroxy ethyl, 2-hydroxy propyl or a mixture thereof, R2 is C5-31 hydrocarbyl, and Z is a polyhydroxyhydrocarbyl having a linear hydrocarbyl chain with at least 3 hydroxyls directly connected to the chain, or an alkoxylated derivative thereof. Preferably, R1 is methyl, R2 is a straight C11-15 alkyl or C16-18 alkyl or alkenyl chain such as coconut alkyl or mixtures thereof, and Z is derived from a reducing sugar such as glucose, fructose, maltose, lactose, in a reductive amination reaction. In another embodiment, the anionic surfactants include alkyl alkoxylated sulfate surfactants hereof are water soluble salts or acids of the formula RO(A)mSO3M wherein R is an unsubstituted C10-C24 alkyl or hydroxyalkyl group having a C10-C24 alkyl component, preferably a C12-C20 alkyl or hydroxyalkyl, more preferably C12-C18 alkyl or hydroxyalkyl, A is an ethoxy or propoxy unit, m is greater than zero, typically between about 0.5 and about 6, more preferably between about 0.5 and about 3, and M is H or a cation which can be, for example, a metal cation (e.g., sodium, potassium, lithium, calcium, magnesium, etc. ), ammonium or substituted-ammonium cation. Alkyl ethoxylated sulfates as well as alkyl propoxylated sulfates are contemplated herein. In yet another embodiment, anionic surfactants include mid-chain-branched anionic surfactants described in U.S. Pat. Nos. 6,320,080; 6,433,207; 6,326,348; 6,133,222; 6,012,781; 6,166,262; and 6,020,303. In still another embodiment, the suitable nonionic surfactants comprise nitrogen containing materials selected from the group consisting of primary, secondary and tertiary amines, diamines, triamines, ethoxylated amines, amine oxides, amides and alkyl betaines, sulfobetaines, and mixtures thereof. Suitable amine oxide surfactants may include C10-C18 alkyl dimethyl amine oxides, C8-C12 alkoxy ethyl dihydroxy ethyl amine oxides, propyl amine oxides, and mixtures thereof. A nonlimiting example of a betaines is Schercotaine materials commercially available from Scher Chemicals. Other suitable nonionic surfactants of this class are generally disclosed in U.S. Pat. No. 3,929,678, issued to Laughlin et al., on Dec. 30, 1975; U.S. Pat. No. 5,230,835, issued to Deguchi et al., on Jul. 27, 1993; and PCT Publication WO 98/28393, by Ofosu-Asante et al., published on Jul. 2, 1998. These and other surfactants suitable for use in combination with the glycerine derivative solvent as adjuncts are well known in the art, being described in more detail in Kirk Othmer's “Encyclopedia of Chemical Technology”, 3rd Ed., Vol. 22, pp. 360-379, which is titled “Surfactants and Detersive Systems”. The surfactant component, when present in the fabric article treating compositions of the present invention, preferably comprises from about 0.01% to about 10%, more preferably from about 0.02% to about 5%, even more preferably from about 0.05% to about 2% by weight of the fabric article treating composition. The surfactant component, when present in the detergent compositions of the present invention, preferably comprises from about 1% to about 99%, more preferably 2% to about 75%, even more preferably from about 5% to about 60% by weight of the detergent composition. In some embodiments, the adjunct ingredients may be cationic materials, such as fabric softening actives. Suitable cationic materials may include quaternary surfactants, which maybe quaternary ammonium compounds. Commercially available agents include Varisoft® materials from Goldschmidt. Nonlimiting examples of suitable fabric softening actives include, but are not limited to: cationic nitrogenous salts, specifically diester quaternary ammonium fabric softening active compounds (DEQA) and polyquaternary ammonium compounds. The cationic nitrogenous salts contain anion A−, which is any softening active compatible anion and provides electrical neutrality. Most often, the anion used to provide electrical neutrality in these salts is from a strong acid, especially a halide, such as chloride, methylsulfate, bromide, or iodide. However, other anions can be used, such as ethylsulfate, acetate, formate, sulfate, carbonate, and the like. Chloride and methylsulfate are preferred herein as anion A−. Suitable odor control agents, which may optionally be used as finishing agents, include cyclodextrins, odor neutralizers, odor blockers and mixtures thereof. Suitable odor neutralizers include aldehydes, flavanoids, metallic salts, water-soluble polymers, zeolites, activated carbon and mixtures thereof. Perfumes and perfumery ingredients useful in the compositions of the present invention comprise a wide variety of natural and synthetic chemical ingredients, including, but not limited to, aldehydes, ketones, esters, and the like. Also included are various natural extracts and essences which can comprise complex mixtures of ingredients, such as orange oil, lemon oil, rose extract, lavender, musk, patchouli, balsamic essence, sandalwood oil, pine oil, cedar, and the like. Finished perfumes may comprise extremely complex mixtures of such ingredients. Pro-perfumes are also useful in the present invention. Pro-perfumes comprise precursor materials or mixtures thereof that are capable of chemically reacting (e.g., by hydrolysis) to release a perfume, and are described in patents and/or published patent applications to Procter and Gamble, Firmenich, Givaudan and others. Examples of perfume and perfume release/delivery vehicles are disclosed in U.S. Pat. No. 6,458,754; U.S. Pat. No. 5,858,959; U.S. Pat. No. 5,552,378; U.S. Pat. No. 6,413,920; U.S. Pat. No. 6,149,375; U.S. patent application 60/423,107; WO 03/002699; WO 99/36469; WO 00/68352; WO 98/28398; WO 98/28339; WO 01/79303 and EP 925,776. Bleaches, especially oxygen bleaches, are another type of adjunct ingredient suitable for use in the compositions of the present invention. This is especially the case for the activated and catalyzed forms with such bleach activators as nonanoyloxybenzenesulfonate and/or any of its linear or branched higher or lower homologs, and/or tetraacetylethylenediamine and/or any of its derivatives or derivatives of phthaloylimidoperoxycaproic acid (PAP) or other imido- or amido- substituted bleach activators including the lactam types, or more generally any mixture of hydrophilic and/or hydrophobic bleach activators (especially acyl derivatives including those of the C6-C16 substituted oxybenzenesulfonates). Also suitable are organic or inorganic peracids both including PAP and other than PAP. Suitable organic or inorganic peracids for use herein include, but are not limited to: percarboxylic acids and salts; percarbonic acids and salts; perimidic acids and salts; peroxymonosulfuric acids and salts; persulphates such as monopersulfate; peroxyacids such as diperoxydodecandioic acid (DPDA); magnesium peroxyphthalic acid; perlauric acid; perbenzoic and alkylperbenzoic acids; and mixtures thereof. wherein R is an alkylene or substituted alkylene group containing from 1 to about 22 carbon atoms or a phenylene or substituted phenylene group, and Y is hydrogen, halogen, alkyl, aryl, —C(O)OH or —C(O)OOH. 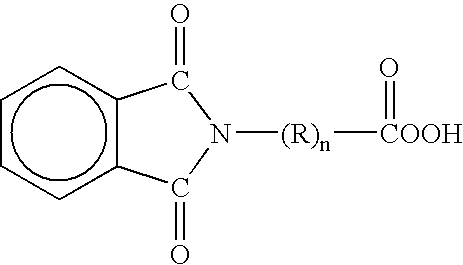 wherein R is C1-4 alkyl and n is an integer of from 1 to 5. A particularly preferred peracid has the formula where R is CH2 and n is 5 i.e., phthaloylamino peroxy caproic acid (PAP) as described in U.S. Pat. Nos. 5,487,818, 5,310,934, 5,246,620, 5,279,757 and 5,132,431. PAP is available from Ausimont under the tradename Euroco®. Other adjunct ingredients suitable for use in the compositions of the present invention include, but are not limited to, builders including the insoluble types such as zeolites including zeolites A, P and the so-called maximum aluminum P as well as the soluble types such as the phosphates and polyphosphates, any of the hydrous, water-soluble or water-insoluble silicates, 2,2′-oxydisuccinates, tartrate succinates, glycolates, NTA and many other ethercarboxylates or citrates; chelants including EDTA, S,S′-EDDS, DTPA and phosphonates; water-soluble polymers, copolymers and terpolymers; soil release polymers; optical brighteners; processing aids such as crisping agents and/fillers; anti-redeposition agents; hydrotropes, such as sodium, or calcium cumene sulfonate, potassium napthalenesulfonate, or the like, humectant; other perfumes or pro-perfumes; dyes; photobleaches; thickeners; simple salts; alkalis such as those based on sodium or potassium including the hydroxides, carbonates, bicarbonates and sulfates and the like; and combinations of one or more of these adjunct ingredients. Suitable finishing aids include, but are not limited to, finishing polymers; such as synthetic or natural polyacrylates or starch carboxymethyl cellulose or hydroxypropyl methyl cellulose, odor control agents, odor neutralizers, perfumes, properfumes, anti-static agents, fabric softeners, insect and/or moth repelling agents and mixtures thereof. The finishing polymers can be natural, or synthetic, and can act by forming a film, and/or by providing adhesive properties to adhere the finishing polymers to the fabrics. By way of example, the compositions of the present invention can optionally use film-forming and/or adhesive polymer to impart shape retention to fabric, particularly clothing. By “adhesive” it is meant that when applied as a solution or a dispersion to a fiber surface and dried, the polymer can attach to the surface. The polymer can form a film on the surface, or when residing between two fibers and in contact with the two fibers, it can bond the two fibers together. Nonlimiting examples of finishing polymers that are commercially available are: polyvinylpyrrolidone/dimethylaminoethyl methacrylate copolymer, such as Copolymer 958®, molecular weight of about 100,000 and Copolymer 937®, molecular weight of about 1,000,000, available from GAF Chemicals Corporation; adipic acid/dimethylaminohydroxypropyl diethylenetriamine copolymer, such as Cartaretin F-4® and F-23, available from Sandoz Chemicals Corporation; methacryloyl ethyl betaine/methacrylates copolymer, such as Diaformer Z-SM®, available from Mitsubishi Chemicals Corporation; polyvinyl alcohol copolymer resin, such as Vinex 2019®, available from Air Products and Chemicals or Moweol®, available from Clariant; adipic acid/epoxypropyl diethylenetriamine copolymer, such as Delsette 101®, available from Hercules Incorporated; polyamine resins, such as Cypro 515®, available from Cytec Industries; polyquaternary amine resins, such as Kymene 557H®, available from Hercules Incorporated; and polyvinylpyrrolidone/acrylic acid, such as Sokalan EG 310®, available from BASF. Suitable adjuncts may also comprise co-surfactants, such as primary alkylamines comprising from about 6 to about 22 carbon atoms are used. Particularly preferred primary alkylamines are oleylamine (commercially available from Akzo under the tradename Armeen® OLD), dodecylamine (commercially available from Akzo under the tradename Armeen® 12D), branched C16-C22 alkylamine (commercially available from Rohm & Haas under the tradename Primene®), and mixtures thereof. The adjunct ingredient may also be an antistatic agent. Any suitable well-known antistatic agents used in conventional laundering and dry cleaning are suitable for use in the compositions and methods of the present invention. Especially suitable as antistatic agents are the subset of fabric softeners which are known to provide antistatic benefits. For example those fabric softeners that have a fatty acyl group which has an iodine value of above 20, such as N,N-di(tallowoyl-oxy-ethyl)-N,N-dimethyl ammonium methylsulfate. However, it is to be understood that the term antistatic agent is not to be limited to just this subset of fabric softeners and includes all antistatic agents. Preferred insect and moth repellent adjunct ingredients useful in the compositions of the present invention are perfume ingredients, such as citronellol, citronellal, citral, linalool, cedar extract, geranium oil, sandalwood oil, 2-(diethylphenoxy)ethanol, 1-dodecene, etc. Other examples of insect and/or moth repellents useful in the compositions of the present invention are disclosed in U.S. Pat. Nos. 4,449,987; 4,693,890; 4,696,676; 4,933,371; 5,030,660; 5,196,200; and in “Semio Activity of Flavor and Fragrance Molecules on Various Insect Species”, B. D. Mookherjee et al., published in Bioactive Volatile Compounds from Plants, ACS Symposium Series 525, R. Teranishi, R. G. Buttery, and H. Sugisawa, 1993, pp. 35-48. The composition of the present invention is directed to attaining improved fabric article cleaning in a solvent treatment regimen, wherein the composition comprises a glycerine derivative solvent in accordance with the present invention and optionally, an adjunct solvent and/or an adjunct ingredient. These adjunct ingredients vary widely and are typically incorporated into the composition at an effective amount sufficient to deliver the desired benefit the particular adjunct is designed for. When present, each adjunct ingredient may, though not required to, comprise from about 0.01% to about 20%, preferably from about 0.1% to about 10%, and more preferably from about 1% to about 5%, by weight of the composition. In some embodiments, the fabric article treating copmposition may comprise from about 1 to about 50%, preferably from about 2 to about 30%, by weight of the composition, of at least one surfactant disclosed above. In a typical embodiment, the adjunct solvent, if included, comprises from about 0.01% to about 50%, preferably from about 0.1% to about 25%, and more preferably from about 1% to about 10% by weight of the composition. The adjunct solvent may comprise a lipophilic fluid. In some embodiments, the adjunct solvent can be selected from the group consisting of octamethylcyclotetrasiloxane (D4), decamethylcyclopentasiloxane (D5), dodecamethylcyclohexasiloxane (D6), and mixtures thereof. In a specific embodiment, the lipophilic fluid comprises decamethylcyclopentasiloxane (D5). In another embodiment, the lipophilic fluid comprises decamethylcyclopentasiloxane (D5) and is substantially free (i.e., less than about 5 wt %, preferably less than about 3 wt %, more preferably less than about 1 wt %, even more preferably less than about 0.5 wt %) of octamethylcyclotetrasiloxane (D4). In some embodiments, the composition may further comprise a polar phase. If included, the polar phase may include water, C1-C16 linear or branched, saturated or unsaturated, aliphatic or aromatic alcohols, such as propanol, ethanol, isopropyl alcohol, benzyl alcohol, and the like, and mixtures thereof. Further, the polar phase typically comprises at least about 0. 1%, preferably at least about 0.1%, more preferably at least about 1% polar phase by weight of the composition and at most about 15%, preferably at most 10%, more preferably at most about 5% polar phase by weight of composition. In a specific embodiment, the polar phase is water, which comprises bound water and about 1% by weight of the composition free water. The “bound water” is intimately mixed/bound with the glycerine ether solvent and cannot be removed by exposing this solvent mixture to absorbent gelling materials (AGM) and the “free water” is the amount of water removed by AGM. The present invention is directed to improving fabric article cleaning in a solvent treatment regimen by contacting the fabric articles with a composition comprising a glycerine derivative solvent, and optionally, an adjunct solvent and/or adjunct ingredients, simultaneously and/or sequentially. The method may optionally comprise a rinsing step and/or a pre-treating step, in addition to the contacting step. Optionally, the method may include the step of exposing the fabric article to a polar phase, simultaneously or sequentially with respect to exposing it to the glycerine ether solvent. If the polar phase includes water, water preferably comprises at least about 0.1%, preferably at least about 0.5% water by weight of the fabric article and at most about 10%, preferably at most about 5% water by weight of the fabric article. In an alternative embodiment, water comprises from about 0.01 vol % to about 5 vol %, preferably from about 0.1 vol % to about 3 vol %, more preferably from about 0.25 vol % to about 1 vol % of the solvent mixture contacting the fabric article. During the contacting step, the weight ratio of composition applied to the fabric article to the dry weight of the fabric article may range from 0.5:1 to 30:1, preferably from about 0.8:1 to about 5:1, more preferably from about 1:1 to about 1.5:1. In other words, the method may be non-immersive as well as immersive. The fabric article may be mechanically agitated, tumbled or otherwise moved in a treatment chamber to achieve uniform application of the composition to the fabric articles being treated. The composition of the present invention can be prepared by mixing the ingredients by any known process chosen by the formulator. The mixing may even be performed by the user by shaking or other known mixing methods. The adjunct solvent may comprise a lipophilic fluid, including but not limited to a linear siloxane, a cyclic siloxane, or mixtures thereof. In some embodiments, the adjunct solvent may comprise one or more cyclic siloxane solvents, such as decamethylcyclopentasiloxane. Due to the flash points of the aforementioned siloxanes, if the siloxanes are included as the adjunct solvents, the method is typically carried out at less than about 80° C.
While carrying out the method of the present invention, the fabric articles may also be exposed to a surfactant and/or other adjunct ingredients, either separately or as a result of being contained within the glycerine ether solvent, polar phase and/or the adjunct solvent. A cleaning system and apparatus suitable for use in the method of the present invention are described below. The cleaning system comprises a fabric article treating vessel, a dry cleaning solvent reservoir, and optionally, a sensor for monitoring the contaminant level in the dry cleaning solvent. When contaminants concentration exceeds some pre-determined value, it would indicate that the dry cleaning solvent has reached maximum contaminant holding tolerance and needs to be purified. Additionally, solvent purification/recovery device comprising a chemical modification unit capable of conducting the purification method of the present invention may also be provided as an integral part of the system/apparatus. However, it needs not be. The solvent purification/recovery unit can be a stand-alone device, separate from the dry cleaning system. Any suitable fabric article treating vessel known to those of ordinary skill in the art can be used. The fabric article treating vessel receives and retains a fabric article to be treated during the operation of the cleaning system. In other words, the fabric article treating vessel retains the fabric article while the fabric article is being contacted by the dry cleaning solvent. Nonlimiting examples of suitable fabric article treating vessels include commercial cleaning machines, domestic, in-home, washing machines, and clothes drying machines. The methods and systems of the present invention may be used in a service, such as a cleaning service, diaper service, uniform cleaning service, or commercial business, such as a Laundromat, dry cleaner, linen service which is part of a hotel, restaurant, convention center, airport, cruise ship, port facility, casino, or may be used in the home. The methods of the present invention may be performed in an apparatus that is a modified existing apparatus and is retrofitted in such a manner as to conduct the method of the present invention in addition to related methods. The methods of the present invention may also be performed in an apparatus that is specifically built for conducting the present invention and related methods. Further, the methods of the present invention may be added to another apparatus as part of a dry cleaning solvent processing system. This would include all the associated plumbing, such as connection to a chemical and water supply, and sewerage for waste wash fluids. The methods of the present invention may also be performed in an apparatus capable of “dual mode” functions. A “dual mode” apparatus is one capable of both washing and drying fabrics within the same vessel (i.e., drum). These apparatuses are commercially available, particularly in Europe. Additionally, the method of the present invention may also be performed in an apparatus capable of performing “bi-modal” cleaning functions. A “bi-modal” apparatus is one capable of performing both non-aqueous washing and aqueous washing in the same vessel, wherein the two washing modes can be performed in sequential washing cycles or in a combination washing cycle. Additionally, the bi-modal machine is capable of fully drying the clothes without having to transfer them to a separate machine. That is, a machine can have the bi-modal function as well as the dual-mode function. An apparatus suitable for use in the present invention will typically contain some type of control systems, including electrical systems, such as “smart control systems”, as well as more traditional electromechanical systems. The control systems would enable the user to select the size of the fabric load to be cleaned, the type of soiling, the extent of the soiling, the time for the cleaning cycle. Alternatively, the control systems provide for pre-set cleaning and/or refreshing cycles, or for controlling the length of the cycle, based on any number of ascertainable parameters the user programmed into the apparatus. For example, when the collection rate of dry cleaning solvent reaches a steady rate, the apparatus could turn its self off after a fixed period of time, or initiate another cycle for the dry cleaning solvent. In the case of electrical control systems, one option is to make the control device a so-called “smart device”, which provides smart functions, such as self diagnostics; load type and cycle selection; Internet links, which allow the user to start the apparatus remotely, inform the user when the apparatus has cleaned a fabric article, or allow the supplier to remotely diagnose problems if the apparatus malfunctioned. Furthermore, if the system of the present invention is only a part of a cleaning system, the so called “smart system” could be communicating with the other cleaning devices which would be used to complete the remainder of the cleaning, such as a washing machine, and a dryer. While particular embodiments of the present invention have been illustrated and described, it would be obvious to those skilled in the art that various other changes and modifications can made without departing from the spirit and scope of the invention. It is therefore intended to cover in the appended claims all such changes and modifications that are within the scope of this invention. 1. A method for treating a fabric article in need of treatment comprising contacting the fabric article with a glycerine derivative solvent. wherein R1, R2 and R3 are each independently selected from: H; branched or linear, substituted or unsubstituted C1-C30 alkyl, C2-C30 alkenyl, C1-C30 alkoxycarbonyl, C3-C30 alkyleneoxyalkyl, C1-C30 acyloxy, C7-C30 alkylenearyl; C4-C30 cycloalkyl; C6-C30 aryl; and mixtures thereof; wherein two or more of R1, R2 and R3 together can form a C3-C8 aromatic or non-aromatic, heterocyclic or non-heterocyclic ring. 3. The method according to claim 1 wherein the glycerine derivative solvent is selected from the group consisting of: 1,3-di-tertiary-butoxy glycerol; 1,2-di-t-butoxy glycerol; 1-t-butoxy glycerol; 2-t-butoxy glycerol; 1,3-di-n-butoxy glycerol; 1,2-di-n-butoxy glycerol; 1-n-butoxy glycerol; 2-n-butoxy glycerol; 2,3-bis(1,1-dimethylethoxy)-1-propanol; 2,3-dimethoxy-1-propanol; 3-methoxy-2-cyclopentoxy-1-propanol; 3-methoxy-1-cyclopentoxy-2-propanol; carbonic acid (2-hydroxy-1-methoxymethyl)ethyl ester methyl ester; glycerol carbonate and mixtures thereof. 4. The method according to claim 1 wherein the glycerine derivative is produced by reacting an epichlorohydrin with an alcohol. 5. The method according to claim 1 wherein the method further comprises the step of contacting the fabric article with an adjunct solvent. 6. The method according to claim 5 wherein the adjunct solvent comprises a lipophilic fluid. 7. The method according to claim 6 wherein the lipophilic fluid comprises a linear siloxane, a cyclic siloxane and mixtures thereof. 8. The method according to claim 6 wherein said lipophilic fluid comprises a lipophilic fluid selected from the group consisting of octamethylcyclotetrasiloxane, decamethylcyclopentasiloxane, dodecamethylcyclohexasiloxane, and mixtures thereof. 9. The method according to claim 6 wherein said lipophilic fluid comprises decamethylcyclopentasiloxane. 10. The method according to claim 1 wherein the method occurs at less than about 80° C.
11. The method according to claim 1 wherein the method further comprises the step of contacting the fabric article with a polar phase. 12. The method according to claim 11 wherein said polar phase comprises water or C1-C16 alcohols. 13. The method according to claim 11 wherein said polar phase comprises at least about 0.1% water by weight of the fabric article. 14. The method according to claim 11 wherein said polar phase comprises at most about 10% water by weight of the fabric article. 15. The method according to claim 1 wherein the method further comprises contacting said fabric article with an adjunct ingredient. 16. The method according to claim 15 wherein the adjunct ingredient comprises a surfactant. 17. A fabric article treated by the method of claim 1. ES2250620T3 (en) 2006-04-16 Dry Cleaning Procedure vapor based siloxanes.